Hitachi Healthcare plans to showcase its new Scenaria View 64/128-slice CT scanner at RSNA 2018 in Chicago. Featuring enhanced dose reduction capabilities and a new open design that can accommodate larger patients, Scenaria View includes an 80-cm aperture, a lateral shift table with a 10-cm shift range, and an 84-kW generator, Hitachi said. The system supports a broad range of clinical applications, according to the firm. Scenaria View CT is not yet available in the U.S.
Hitachi has received 510(k) clearance from the U.S. Food and Drug Administration (FDA) for its real-time image gating system for proton beam therapy. 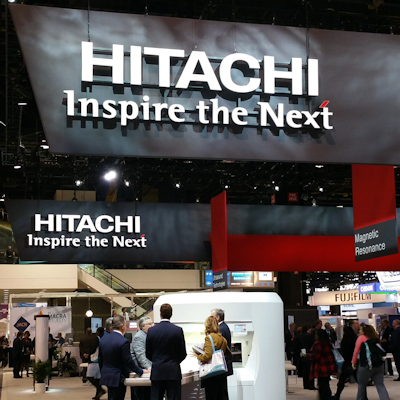 In a bid to expand its healthcare informatics portfolio, Hitachi Healthcare Americas has signed an agreement to purchase imaging informatics firm VidiStar. Hitachi of Tokyo has signed an agreement to buy the particle therapy business of Japanese industrial conglomerate Mitsubishi Electric.